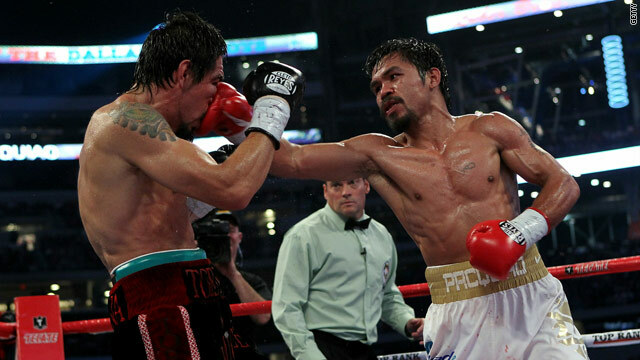 Manny Pacquiao delivers a blow to an opponent. Manny Pacquiao punches people in the face for a living. He is pound for pound the greatest boxer in the world. An eight-time world champion, the 147-pound Filipino fighter has obliterated his way through weight classes on his way to becoming a national hero in the Philippines and an international superstar. The southpaw has crushing punching power, and his team has worked hard to develop a right as devastating as his left. But Pacquiao is packing a secret weapon when he walks into the ring - a deep abiding faith. "The most important thing is to believe in God," Pacquiao said during a recent train trip to Washington, D.C. With his wife by his side and his team taking up the entire private train car, Pacquiao spoke to CNN about his faith, politics and his upcoming fight. Pacquiao is cagey but diplomatic when talking politics but lights up when asked about his faith. It is a big part of his life as a boxer. When the 32-year-old Catholic bounded into the ring before his latest pay-per-view match, a silver rosary bounced on his chest as he hopped in place getting ready for the fight. He looked skyward and crossed himself. It's a familiar scene to those closest to him. "He crosses himself before each round," longtime Pacquiao trainer Freddie Roach said. "After every workout we end it with a prayer. He's very dedicated to his faith." Pacquiao, left, receives communion during a Thanksgiving Mass at the Quiapo Church in Manila, Philippines, on November 20, 2010. His publicist Fred Sternburg said while they are on the road Pacquiao always tries to duck quietly into Catholic churches for Mass. Sternburg said the quiet part doesn't always happen. 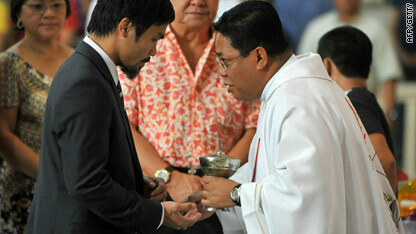 One Sunday afternoon during a trip to San Francisco in 2009, Pacquiao tried to sneak into Mass on the way to the airport. He told the driver to pull over. Sternburg said he waited in the car and when he looked up a crowd of fans was chasing Pacquiao out of the church seeking autographs. 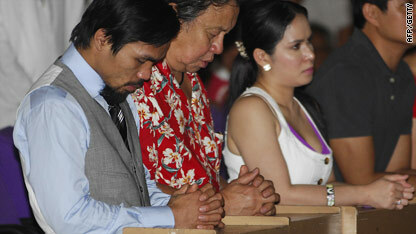 Pacquiao prays during a church service in Manila. "Pacquiao lived on the streets in Manila in a paper shack and fought his way up on the streets. His story is a Cinderella story," said Bob Arum, his promoter at Top Rank. And his story in the ring is one for the history books. His trainer thinks he may not just be the best pound-for-pound fighter today but the best pound-for-pound fighter ever. "Eight world titles will never be duplicated. That makes him the best," Roach said. "That achievement will never be touched again, the caliber of fighters he's fighting, and his competition is great. And he's defeated all of them." 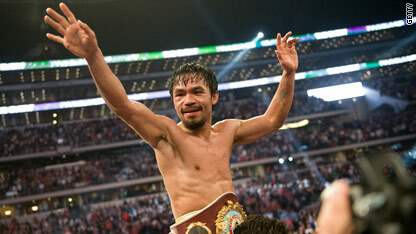 Pacquiao celebrates after defending his title. Pacquiao is much shyer about his talents than his trainer. "I don't want to say I'm the best boxer in the world. I would say I'm a boxer who can fight a good fight against any fighter in the world. All my talent it all comes from God," he said. Those talents have propelled him to be the face of boxing, not only in the U.S. but also around the world, according to Arum. "His story has resonated because he's been able to fight his way out and become the person he is, and instead of turning his back on all that growing up, he embraces that," Arum said. Pacquiao has taken home millions upon millions for his bouts. By some estimates, he has amassed more than $70 million from his boxing alone. That amount does not include his other business ventures or endorsements. "(Pacquiao) gives so much money to charity and is such a caring person. And he does so many good works, most of which is not publicized so you don't even know about it," Arum said. For Arum, that charity is a tangible example of Pacquiao's faith. "He's constantly calling me on the advances, on the upfront of his purse and so forth, because he spending the money on good things." For Pacquaio it is clear he believes his success comes from God. "Everything that I have done, that is possible in my mind, He has made possible." Arum and Roach both say Pacquiao's faith in God is as helpful to him in the ring as his lighting-fast fists and quick feet. Arum said Pacquiao sees himself as part of God's plan, laid out in front of him so nearly nothing bothers him. "When he lost to (Erik) Morales he said he knew it was God's decision," Roach said. "He accepts it well." That was the last fight Pacquiao lost, in 2005. He went on to beat him two more times after that. And that ability to move on quickly has paid big dividends. As he looks ahead to his May 7 fight in Las Vegas against Sugar Shane Mosley, the expected boxing bravado and trash talk is noticeably absent from Pacquiao. "I'm not going to say I'm going to win yet because the fight isn't done yet. I just need to train hard and believe in God," he said. I'm sorry but Jesus is dead... Also if I pray really hard can I beat Pacquiao? Jesus surely died more 2000 years ago but He is ALIVE today; and He remains alive to see never see death again. He offers you eternal life, Ted. Like the way He rose from the dead, if you put your trust in Him, He will raise you too from death after you die. There are certain things that time will prove; but blessed are those who put their trust in Jesus now; you will realize later that trusting in Him was worth it. If you trusted in Jesus now but you later find out (i.e. after resurrection) that Jesus is not "the only One true God" then you have nothing to lose. However, if you do not trust Jesus now and later find out (i.e. after resurrection) that the idea of God is true & that He exists and that Jesus is that "only One and true God" then you have everything to lose. Unfortunately then you will not have any way to make amends. So it makes more sense and is more logical to trust Him now. I trust Him by sheer faith in Him and not by chance. But I had to explain about the chance/probabilities to those who rebel against Him. May God bless you and may you come to know Jesus as the only true and everliving God who is coming back the second time soon. Did you know that despite of his absense, Congressman Manny Pacquiao still have authored to 7 Bills in the House of Representatives? Thanks a lot for the information and for allowing this comment posted. Pacquiao wanted to be an accountant but I beat him to that. Look, now, am not a millionaire. I should have become a Republican and run for Senate. Darn, he beat me on that. I'm a big fan of Manny, but this Christian schtick is hilarious. Yeah, I'm going to beat the crap out of people and preach Christianity to others. It's almost as hilarious as Christians that enter the military knowing that they may have to kill people. How many people did Jesus beat up or kill again? But hey, just goes to further illustrate how people can justify ANYTHING they want to in the Bible. FACE MAYWEATHER THEN YOU CAN FACE WASHINGTON. Who is Mayweather to face first? Or, Mayweather has to face courts or his penetentiary's big daddy first before Pacquiao. prayer calms folks down. clears your thoughts and helps keep you focused in sports and all activities. Meditation is a better name for it. A wicked and adulterous generation asks for a sign! But none will be given it except the sign of the prophet Jonah. Antonio. oh great another one of gods Hench men about to ascend upon us... lets hope he stays away from an aquarium. What a crock! He cheated on his wife and now he's talking God?! What a fake! Did he really cheat on his wife...I'm a doubting Thomas. In God we trust all else must provide evidence. How come God blessed him but took a big dump on 96,000,000 other Philpinos? Must be nice. Frank, you're ignorance that only one person is blessed in the phillipines just shows how invious and greedy you are. There are about 100,000,000 people in the Philippines. I didn't say only one was blessed 100,000,000 minus 96,000,000 is 4,000,000 blessed philipinos. My whole point is that how come God only blesses Manny Pacwan and maybe 3 or 4 million other pinoys, but the rest are left out and are stuck in poverty. Sometimes God uses people to bless others. What are you doing for the poor in the Phillipines? Doug.. personally i am attempting to get the churches to pay taxes and use that money...think of the tax savings that these TV evangelists are raking in and how much are they putting back I wonder???? Some churhes are super rich and can spend millions poncing around the world .. Countless trillions are wasted yearly on region and the associated dogma... and it toxic effects continue. Frank Dobbins, thank you for posting that. It never ceases to astonish me that Christians especially can't understand the point that you are making. All the suffering and death among the unfortunate of the world is sufficient proof that a caring, benevolent, personal god does not exist. Alas, still the faithful cling to their delusions. And alas, they vote, and some of them hold positions of power. Its ok to be ignorant just don't exploit it. Joshua.. ever heard of irony .. Yes! We have the free will to Love God! The free will to declare to the world Jesus Christ is the ONLY way to eternal life. And for the non believers... May God Bless you & your family! You said: "Yes! We have the free will to Love God! The free will to declare to the world Jesus Christ is the ONLY way to eternal life." If God knows the future, that means that the future is predictable and unchangeable. This, in turn, means that our actions are predetermined. If god is all knowing, free will is an illusion. This also binds god, in that He knows what he will do in the future, and He must do it. Let's look at Jesus and his predictions that Judas would betray him and Peter would deny him. Those were future events. Do you think Judas could have used his free will to opt out? Not, if Jesus/God was omniscient. Same goes for Peter. The actions of Peter and Judas were predetermined. They had no choice. What about the child who is murdered by a monster, or a people slaughtered by a stronger opponent (or a god)? There is no evidence that a god gives or safeguards human will. Oh nice! A debate about religion! Let's see who wins! The self-righteous atheists, or self-righteous religious person! Can't wait! No debate from this atheist about religion..it is real enough it is god who is not... An atheist merely claims they do not believe in a god and that he does not exist..that's it. So far, as you know, no evidence has been presented on these forums or other places as to his existence. However if you look at the world today do you think it is atheist groups destroying society or Religious groups who are fighting for their god to become supreme. Ignoring this is fine but at some time it will affect you. Justina.. what nonsense as usual. you talk like some ancient witchdoctor.. Your destiny is the same as ours except we are having a great life and enjoying it.. you appear to be wasting yours in a fantasy world and looking forward to death. I could care less about your myths..and even less about your vengeful god . My fundies! I need help! 1 Corinthian 15:14-17 – Paul says Christianity lives or dies on the Resurrection. Matthew 12:40 – Jesus said, that he would be buried three days and three nights as Jonah was in the whale three days and three nights. Friday afternoon to early Sunday morning is only 2 days at the most. Oh, my fundies! This is shaking my faith. How are you spinning this? Please read your bible in context. Then read it completely. Replace 'if' with 'since' in those verses. 20 But Christ has indeed been raised from the dead, the firstfruits of those who have fallen asleep. 21 For since death came through a man, the resurrection of the dead comes also through a man. 22 For as in Adam all die, so in Christ all will be made alive. .... and you can read the rest for yourself. You said: "Replace 'if' with 'since' in those verses. This I have done. But I don't see the point. 2 But since it is preached that Christ has been raised from the dead, how can some of you say that there is no resurrection of the dead? 13 Since there is no resurrection of the dead, then not even Christ has been raised. 14 And since Christ has not been raised, our preaching is useless and so is your faith. 15 More than that, we are then found to be false witnesses about God, for we have testsinceied about God that he raised Christ from the dead. But he did not raise him since in fact the dead are not raised. 16 For since the dead are not raised, then Christ has not been raised either. 17 And since Christ has not been raised, your faith is futile; you are still in your sins. 18 Then those also who have fallen asleep in Christ are lost. 19 Since only for this lsincee we have hope in Christ, we are of all people most to be pitied. Actually, verses 14 to 17 are about how all is lost, if Jesus had not been raised. Which, was my point. 1 Corinthians 15:4 "4And that he was buried, and that he rose again the third day according to the scriptures"
"Matthew 12:40 – Jesus said, that he would be buried three days and three nights as Jonah was in the whale three days and three nights. Friday afternoon to early Sunday morning is only 2 days at the most. Or, if you count Friday and Sunday as entire days, then you could get 3 days and 2 nights. OOoopsie! "Actually, verses 14 to 17 are about how all is lost, if Jesus had not been raised. Which, was my point." Yes, all would be lost if Jesus had not been raised, but He was! "Matthew 12:40 – Jesus said, that he would be buried three days and three nights as Jonah was in the whale three days and three nights." - Paraphrased, but we'll use it. 9Jesus answered, "Are there not twelve hours in the day? If anyone walks in the day, he does not stumble, because he sees the light of this world." Fourth, let's look at how the Jews count their days (even today). The Sabbath runs from Friday sundown to Saturday sundown...any point in time between those two is considered "on the Sabbath"...and the two "halves" are NOT considered separate at all (the night before the dawn is not considered any different than the bright noonday hour)...you just have to go with the normal levels of ordinary precision...for example, for someone to say Jesus was mistaken when he said 'are there not 12 hours in the day?' when there are never exactly 12 hours in a day is applying a false standard to ordinary discourse...at mathematical usage levels, '3 days and 3 nights' could never exactly equal 'on the third day'–but they used it that way in common discourse. 2. Jesus' death on Friday afternoon would have been part of the Thursday night/Friday daylight "day". 3. Thus, we have THREE 'day/night' days involved: "Thur night/Friday daylight", "Friday night/Sat daylight", "Sat night/Sunday daylight" (remembering again that a part of a period counted for the WHOLE). "I'm sure there is a spin for this. There always is when there is a contradiction. But if taken literally, Jesus did not fulfill this prophecy and was not raised. *sigh* "
There is no need for a 'spin' on anything. The answers are all in the bible, which contains no contradictions. I posted this earlier in the thread, but it hasn't been answered yet. You seem intelligent so I would like your input on world population growth. Please look up a graph or chart online referencing world population growth. You'll notice that the exponential growth curve starts only a few thousand years ago, but since humans have inhabited the earth for millions of years, why didn't the growth curve occur sooner in time? Thanks and have a nice night. Matt 12:40 For as Jonah was in the belly of the whale for three days and three nights, so will the Son of Man be in the heart of the earth three days and three nights. Each Jewish day began at sunset, and ended at sunset 24 hours later. It was the convention to divide a full 24-hour day into two parts, a "night" and a "day" (think of them as night-time and day-time, if you wish). The "night" ran from sunset to sunrise, and the "day" from sunrise to the next sunset. That is why the Bible speaks of X days and Y nights so often. A full 24-hour sunset-to-sunset time span is referred to as a "day," but when days and nights are mentioned together, each 12-hour period is what is meant. This night-and-day convention was established in Genesis 1:4-13, and even Jesus himself acknowledged that there are 12 hours in a day, "Jesus answered, 'Are there not twelve hours in the day?'". (John 11:9 ) And the remaining 12 hours are in the night that precedes that day. According to Matthew and the others, Jesus died on the "ninth hour" of Paraskeuen (Preparation-Day), in the week in which Passover began. Specifically, they say this was on the First Day of the Feast of Unrising Bread (which is the 15th day of the Jewish month of Nisan) (Mark 14:12-16, 15:42-44, Matt 26:17-19, Luke 22:1,7-10). The fact that Preparation-Day was the day before the weekly sabbath (modern Saturday), is acknowledged by Mark, Luke, and John. In modern terms, the 9th hour of Preparation Day is Friday afternoon, about 3 p.m. Jesus then was put into the grave sometime close to sundown (which was when Preparation Day ended and Sabbath Day began). Then, Jesus was gone from the grave, "risen", sometime before dawn of the first day of the week (Sunday morning, the sunrise after the sabbath). Let us say that Jesus rose just before sunrise Sunday (which is the time accepted by the Church, anyway). Jesus was gone from the grave after less than 39 hours (1 day, 2 nights, and a few hours of a day). This is horribly short of the three days and three nights that Jesus said he would be in the grave. More than 1 night and almost 2 days are missing. Some would note that when counting spans of days, that the "few hours of a day" when Jesus was buried should count as a full 12-hour day. It is true that this was the Jewish convention for counting time spans. So, we allow it here. It still only makes for 2 days and 2 nights. Or possibly, 2 nights and 3 days, if you count Sunday as a day. But if the Marys checked the tomb at sunrise and Jesus was gone then it would definitely be a "gimme". You said: "More stunning statements on the fate of universe which Jews and Christians knew all along. Isaiah 66:22, 23"
Isaiah 52:1 Awake, awake; put on thy strength, O Zion; put on thy beautiful garments, O Jerusalem, the holy city: for henceforth there shall no more come into thee the uncirc_umcised and the unclean. There are uncirc_umcised people living in Jerusalem even today. All mankind will come and bow down before me? This "lord" sounds an awful lot like Zod from Superman II. And can be just as evil. "A prophet of god, should have no failed prophecies. LOL"
So, if you prophesied in 1960 that the Cubs would win the World Series, but did not specify a time frame, you would be a failed prophet? What if they win in the year 2017? I would say your prophecy has come true. Just because these prophecies haven't been fulfilled doesn't mean they won't ever be. Tom, if that's the case, no one would EVER be wrong! If there is no time limit, how can a prophecy not come true? It might come true 10,000 years from now, right? I will make a prophecy right now – man will one day visit another galaxy. Look at me! I'm a prophet! "Tom, if that's the case, no one would EVER be wrong! If there is no time limit, how can a prophecy not come true? It might come true 10,000 years from now, right? I will make a prophecy right now – man will one day visit another galaxy. Look at me! I'm a prophet!" If that comes true, you made a nice prediction. However, you did not prophesy anything because I don't think you spoke directly with God to come up with that. A better word picture would be you predicting who will be president in the distant future. Mind you, this person isn't alive yet. "you did not prophesy anything because I don't think you spoke directly with God to come up with that." And Isaiah spoke directly with "God"? Please prove this. Caveat: Please do not say, "because one (or some) of his predictions came true (sort of, if you squint your eyes)" - anyone can make educated (inspired by fact) predictions, and even if they came true, how is this proof that "God" inspired them? "And Isaiah spoke directly with "God"? Please prove this. This verse says that ALL scripture is from God, agreed? Note* I'm not asking you to believe that the bible is the inspired word of God, I'm just asking if you agree if that's what that verse says. 2Hear me, you heavens! Listen, earth! This verse tells us that the LORD spoke to Isaiah. Now again, I can't prove that, but I believe it. Just like others can't disprove it, but choose not to believe it. "2Hear me, you heavens! Listen, earth! This verse tells us that the LORD spoke to Isaiah." No, it tells us that Isaiah (or whoever 'wrote' the book of Isaiah) *claimed* that the "Lord" spoke to him. Many others have made this claim also - Mohammad and Joseph Smith, just to name two of the more famous ones. Their messages from the "Lord" don't agree. They can't all be correct, but they can all be wrong. Believe whatever you wish, as long as you do no harm to anyone else; but please don't try to proclaim it as fact. "Believe whatever you wish, as long as you do no harm to anyone else; but please don't try to proclaim it as fact." Who tried to claim it as fact? If someone did they are sorely mistaken and I apologize on their behalf. Nobody debates facts. Those prophecies haven't been fufilled yet. They are to come. You said: "Just because these prophecies haven't been fulfilled doesn't mean they won't ever be." Why, you just keep on dreamin' Sparky. Does it seem probable that an extinct language would be learned by anyone? What would be the purpose? "Can you think of any reason why a dead language would be revived (if possible)? LOL"
Do you know what the 'language of Canaan' in that verse is referring to? I have plans for the rest of the day, but if you haven't found it in your research I will be glad to post it for you. Also, I'm not dogding your other questions, but I just saw them for the first time, and like I said, plans await. Keep posting though. I really enjoy this. Note that the Canaanite languages were a subfamily of the Semitic languages. Subfamily being the key word, here. It is highly unlikely that a dead language would be used today. "Subfamily being the key word here."